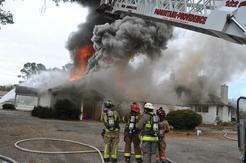 The Pasquotank Providence Fire Department is lead by its Operational Officers (Chief, Asst. Chief, First Captain, Second Captain, 4 Lieutenant's) and Governed by the Administrative Officers (President, Chief, Vice-President, Secretary, Treasurer, and two Board members) who are responsible for making decisions within the confines of their position, as laid out by the Pasquotank Providence VFD bylaws. Operational Officers are also responsible for the daily operations of the Fire Department. Board positions are voted on by the general membership. Operational positions are appointed by the Chief. The Pasquotank Providence Fire Department's business meetings are held at the station on the Third Tuesday of every month. Regularly scheduled Training Nights are the Second Monday of every month.